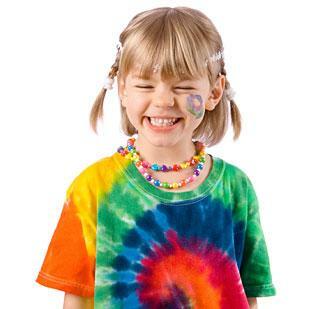 Kids of all ages love creating new things, whether it's a tie-dye shirt or an ice cream treat on an especially hot day. In most cases, the messier the project, the better. Keep the kids active and let their imaginations soar with these great projects. Sheet painting is a fun activity that involves water, painting and making a mess - three things that kids love. String the sheet across the clothesline. Using the hose, thoroughly wet down the sheet. Dress the kids in old clothes that they can get paint on. Allow the kids to use the paints and brushes to paint the sheet. When the kids are ready to do a new design, hose down the sheet and start over. Tie-dyeing was groovy in the 70s, but kids today still love to design their own textiles. Today's fabric dyes are more color safe and less likely to run. Dress your kids (and yourself) in clothing that you don't care about. Have everyone wear disposable latex gloves. Mix the dye according to package instructions in the three gallon buckets, mixing in a cup of salt for each bucket. Take the fabric you will be dyeing and wrap rubber bands tightly around the fabric in places where you would like the white to show through. Using the tongs or stick, lower the prepared fabric into the buckets of dye. Leave in the dye according to package instructions. Remove the garments from the dye and treat/rinse/wash according to dye package instructions. You can also dye by hanging textiles from a clothesline and using squirt bottles to squirt dye on them. Turn your yard into a golf course, or, if you don't have a yard, set up your course at a local park. Mark hole locations on horizontal surfaces around the yard, such as trees and rocks, using tape marked with numbers or chalk to indicate the hole number. Mark starting locations for each hole with either tape or chalk. 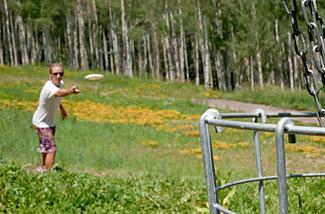 Have the kids start at hole one's starting location and toss the Frisbee in the direction of the "hole." Write how many shots it takes to get to each hole from the starting location. The person with the lowest score after the course has been completed is the winner. Tinikling is the national dance of the Philippines. It is similar to jumping rope. Two people squat down (or sit) and grasp the ends of both poles, holding the poles parallel to one another a few inches above ground height. The poles should be a few feet apart to start. From the starting position, tap the poles rhythmically, twice on the ground, returning to the starting height, and then at the starting height, clap the poles together in a one, two three rhythm. On count one, touch the poles to the ground and return them to the starting height. On count two, touch the poles to the ground and return them to starting height. On count three, at starting height, clap the poles together. Repeat this in a rhythmic fashion. Once the pole operators have established a rhythm and are comfortable with the movement of the poles, start the tinikler with their feet together, standing in between the two poles. On beat one, the jumper jumps with his feet together between the poles. On beat two, the jumper jumps as he did on beat one - feet together between the poles. On beat three, the jumper jumps so that his feet are wide and land outside of the poles. On beat one, he jumps so his feet are together between the poles again. Continue this jumping rhythm until there is a miss. If the heat has driven you indoors, cool off by making ice cream in a bag. You don't need any fancy equipment, just some plastic bags. Mix the milk, vanilla and sugar inside one of the quart-sized bags. Squeeze out as much air as possible before sealing, then place this bag inside the second quart-sized bag. Place the double-bagged mixture inside the freezer bag and fill the large bag with ice and salt. Seal and shake, shake, shake until your mixture resembles soft-serve ice cream. Few things fascinate like the science of flight. Did you know that you can have your kids make a hot air balloon? A great rainy-day boredom buster or an activity for a windless day, this science activity will keep your kids learning and busy. *One of the tricks to this project is getting the right kind of plastic. You need the thin waste basket liners that you can find in office supply stores or from a janitorial service. You can also get plastic that is big enough and thin enough from a dry cleaner. The bags that they use to cover clean clothes are perfect for this type of project. Cut a square of aluminum foil with 4-inch sides. Mark your aluminum foil with four spots about an inch from each side. These spots represent where you'll put the candles. You want the candles to sit so that they are spaced fairly evenly on the foil. Melt the bottom of the candle a little, and then attach the candle to your foil on the spots you've marked. You may need to heat the underside of the foil and candle to help it stick. Hold it very still while the wax solidifies. Use drinking straws to create an 'X' that will hold the balloon open. To do this, you'll have to tape several sections of straw together. You can stretch the plastic bag one way before you measure and that will help you know how long to make your straw 'X'. It shouldn't be taut, but it shouldn't be too loose either. Also, if you are using a bendy straw, make sure to cut that part off. Reinforce the 'X' in the middle with extra tape. Be careful though - you don't want it too heavy either. Next, tape the 'X' into the ends of the plastic bag. Holding the balloon upside down, tape the aluminum platform onto the center of your 'X' frame. Make sure that the candles do not sit directly over the straws. You can also tie thin thread to the 'X' frame if the balloon will fly out of reach. Holding the top of your hot air balloon, light the candles. As the balloon fills with hot air, it will begin to 'puff up' and take flight! With this project, you're only limited by your creativity. If you get t-shirts for all of your kids in the same bright color, this project has the added benefit of making your clan easy to spot in a crowd. Start with a clean surface and insert your cardboard rectangle inside your t-shirt. This gives you a stiff background to work on, and helps keep paint from leaking through should you get too much on the t-shirt. Cut a potato in half with your kitchen knife. Insert your metal cookie cutter into the potato. Leave it in there so you have something to cut around. Using your craft knife, cut around the metal cookie cutter. You want your design to protrude at least a half-inch from the potato. Remove the cookie cutter, which will leave you with your design. Take fabric paint and cover the design on the end of the potato and stamp away on your t-shirt. You may want to use an extra piece of scrap paper as a blotter in case the paint on the potato looks a little too thick. Use a different potato for each color. Many eco-enthusiasts talk about the benefits of solar cooking since it creates no emissions and is a very clean way to cook. Spray paint the inside of the shoe box with the black paint. Let dry. Cut a rectangle out of your shoe box lid. Turn it over, so that you are looking at the underside of the shoe box, and cut the oven bag to fit in the shoe box lid. Use tacky glue, a heavy-duty stapler, or duct tape to affix the plastic in place. When you're done, your shoe box lid should look something like a window. Create your S'more and wrap it up in heavy-duty foil and set it inside your shoe box. Put the lid on your shoe box. Place the box in the sunshine. 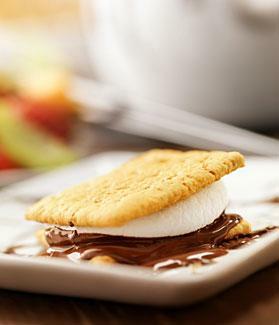 After an hour (or less on a hot day), carefully take out your s'mores and enjoy! 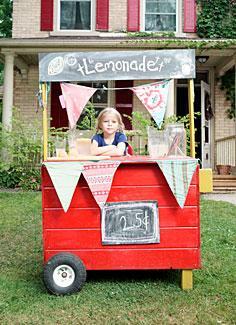 Earn some extra cash this summer by running a business on your driveway. You're only limited by your creativity on this one. Whether you want to sell homemade friendship bracelets, sell your used books and toys, or run a summer-long garage sale, you can turn this boredom buster into some cash. First, decide what you're going to sell and when you're going to sell it. It is ideal if you can commit to opening your stand at the same time every week, or for one week but at the same time every day. This helps build word-of-mouth and people who don't live in your neighborhood might come out to test your wares when they know you'll be there. You'll need to create at least two posters: one poster to announce prices and one poster to draw attention to your stand. Ideally though, you'll create a few posters to put up in the neighborhood, as well as flyers. Get change for your cash box so that people who are paying in large bills can get change. An array of five, ten and single dollar bills, as well as a roll of quarters, is enough to get you started. Advertise. Post posters at the end of your street and put the flyers up in local grocery stores on the community bulletin board. Run your stand! Don't be discouraged if few people come at first. If you let people know that you are going to be back, they are likely to come again and support your cause. Does your mom have a Facebook page? Ask her if she'll announce your stand on her Facebook page. This helps her friends know to come on by and support you. You don't need to live near a beach to build a sandcastle! This recipe will make enough sandcastle clay for one medium-sized sandcastle. Mix together the sand, cornstarch and alum in a large saucepan. Turn the burner on to medium-high heat and slowly add water to the powdered mixture, stirring constantly. 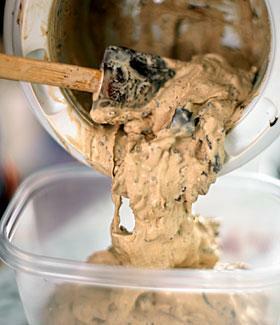 Keep cooking until the dough is thick and moves away from the sides of the saucepan easily. The dough will be similar in texture to play-dough. Let the dough cool completely before handling. 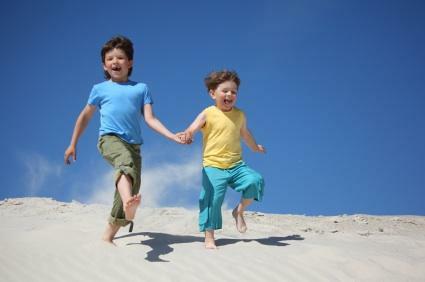 Let kids sculpt with the sand until their hearts are content. Don't forget, boxes, paper towel tubes and other molds' make great sandcastle sculpting tools! Once your child is satisfied with his creation, let the sculpture dry. Once it is dry, you can use tacky glue to add any embellishments that you'd like such as shells, etc. If you're lucky, you won't have to hear "I'm bored" too often this summer. Once the kids have mastered the art of tie-dyeing and the tinikling dance, they'll hopefully want to practice over and over. Once they've found new projects they love to work on, they may be able to branch out and experiment more, with new ice cream flavors, for example, and games that combine multiple sports into one. Give the kids a few tools for fun summer projects and they'll do much more than sit inside and play video games.